Aerial Triangulation , Block Adj. automatic measurement of tie points coordinates on images, relative orientation of block images and also image block adjustment. Create Digital Terrain Model (DTM) – digital cartographic presentation of terrain surface both as regular grid of elevations (DEM) and as triangulated irregular network (TIN). Create 3D vector objects; orthophoto production. Stereo Processor is an integrated software package specially intended for generation of the ground relief digital elevation models (DEM) via processing of the pairs of images acquired by spaceborne SAR's. Stereo processor provides for users an extraction of terrain height information from stereo pairs of SAR satellite imagery. 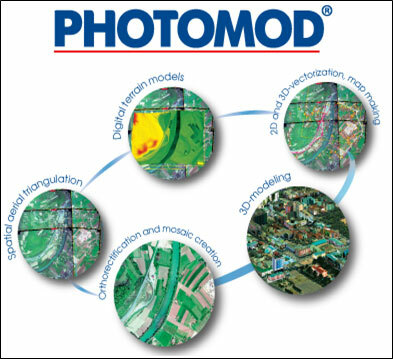 It allows to generate an accurate digital elevation models (DEMs) of imaged ground surface. Oil slicks detection processor is intended for oil slicks detection against a background of homogeneous sea surface. Polarimetric processor realizes the technique of joint processing of images acquired with different signal polarization. In common case it allows classifying the resolution cells on images upon their physical properties. Processor can deal both with full polarimetric matrix (four combination of polarizations for transmited and received signals) on input and with incomplete polarimetric matrix (two combination).